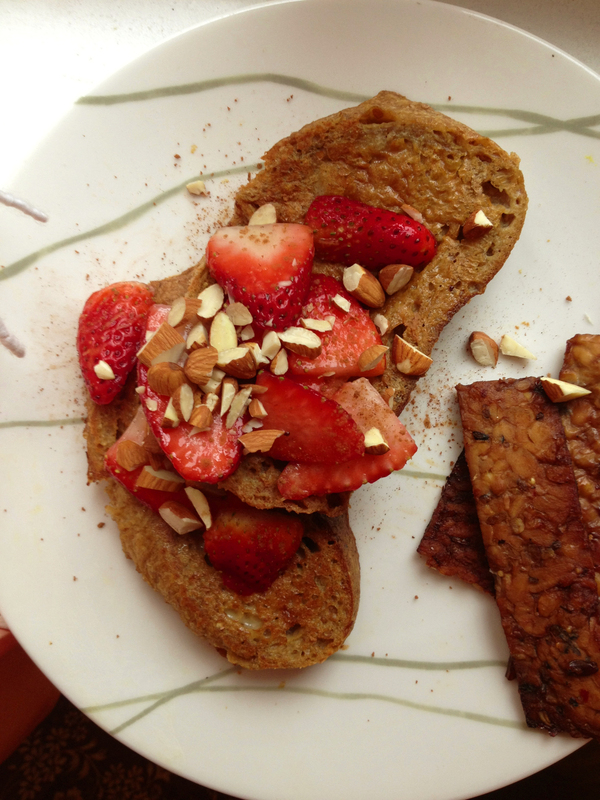 vegan french toast! it is easy. Preheat your oven to 250. In a serving bowl, combine sliced strawberries, sugar and lemon zest and a small squeeze of lemon juice. Stir and let sit while you make the french toast. Heat a non stick pan, and melt a tsp of earth balance in it. Then in a shallow bowl, whisk together almond milk, vanilla, flour, Vegg, cinnamon and nutritional yeast. Once the Vegg powder hits the liquid it will get really farty in your kitchen for a second, but don’t be alarmed, it tastes good and it’ll go away. Perhaps capitalize on this time to do your own farts, no one will know. dip your bread quickly in the mixture, shaking off any excess then fry in the pan until golden. Flip and cook the other side until also golden. Continue like this, adding more margarine as needed. As you go, put the french toast in the oven to keep warm. Serve with strawberries, chopped almonds and maple syrup. Next PostMY HUNDREDTH POST, YOU GUYS!